Get out! Run! We must leave this place! They are going to destroy this whole place! Go, children, run first! Go now! 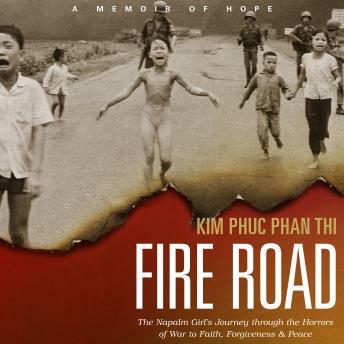 These were the final shouts nine year-old Kim Phuc heard before her world dissolved into flames-before napalm bombs fell from the sky, burning away her clothing and searing deep into her skin. It's a moment forever captured, an iconic image that has come to define the horror and violence of the Vietnam War. Kim was left for dead in a morgue; no one expected her to survive the attack. Napalm meant fire, and fire meant death. Against all odds, Kim lived-but her journey toward healing was only beginning. When the napalm bombs dropped, everything Kim knew and relied on exploded along with them: her home, her country's freedom, her childhood innocence and happiness. The coming years would be marked by excruciating treatments for her burns and unrelenting physical pain throughout her body, which were constant reminders of that terrible day. Kim survived the pain of her body ablaze, but how could she possibly survive the pain of her devastated soul? Fire Road is the true story of how she found the answer in a God who suffered Himself; a Savior who truly understood and cared about the depths of her pain.